Mary Beard has been tweeting about Cambridge,s Martyr’s Memorial, which is rather anomalously placed on a park bench (http://timesonline.typepad.com/dons_life/2013/06/the-cambridge-martyrs-memorial.html). Cardiff has its own Martyr’s Memorial, placed even more idiosyncratically on the wall of the gents’ formal suits department in James Howell’s department store. I wouldn’t think that 99% of the men who go there to get suited and booted for weddings and funerals know who it commemorates, still less why he died such a painful death. So who was Rawlins White? According to Foxe’s Acts and Monuments (better known as the Book of Martyrs), he was a simple Cardiff fisherman. He heard the Bible being read and preached in Cardiff, probably in the late 1540s or early 1550s, during the reign of Edward VI. Feeling that he was too old to learn this newfangled business of reading, he sent his little son to school instead, and the boy read the Bible to his father in the evenings while they were mending their nets. Though he could not read, White learned much of the Bible by heart and became a preacher himself. But then in 1553 Edward died and his Catholic sister Mary came to power. Rawlins White was arrested, questioned and eventually burned at the stake. Foxe’s account describes him sending a message to his wife asking her to send him his best shirt to be burned in, though victims at the stake were usually stripped. The full story is online. Martyrdom should be simple and clear – but like so many martyrdom stories, this one is more complex than it appears. If you read between the lines of Foxe’s account, it’s clear that Rawlins White was the leader of a group of radical Protestants. He was arrested at the very beginning of Mary’s reign, at the same time as those much more high-profile martyrs Cranmer, Latimer and Ridley. 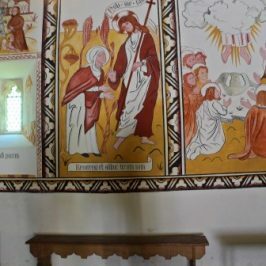 And he was not executed for another two years, so he was dealt with by due process of law – Mary and her advisers were more interested in high-visibility recantations than in creating martyrs. Then there’s the role in all this of the local bishop, Anthony Kitchin. He has had a bad press, not all of it deserved. He became bishop of Llandaff in 1545, when he was already in his 60s, and served under Henry, Edward, Elizabeth and Mary. This suggests a degree of flexibility not usually found in the Reformation period. But I have a soft spot for him, and I can see his point. Opposing government policy in those days didn’t leave you with a spell on the back benches: instead, it could lead to a slow, painful and sticky death. And what good would it do his diocese if he was removed and replaced by an extremist from one side or another? So he dug his heels in and tried to blunt the impact of some of the more dramatic changes. Reading between the lines again, we can see that he even tried to save Rawlins White, keeping him under very lax house arrest in the episcopal palace at Mathern and even encouraging him to escape. Foxe’s story also mentions White’s associates, who were allowed to visit him in prison and encourage him. None of them were arrested or punished. 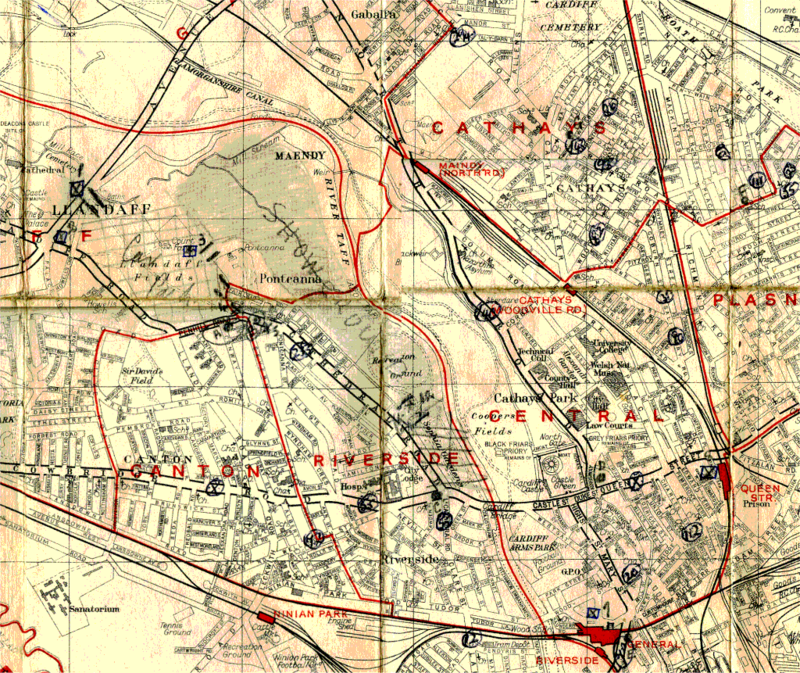 White was burned in the south part of the tiny borough of Cardiff. When the town expanded in the nineteenth century a chapel was built near the spot and a memorial plaque was put on the chapel wall. 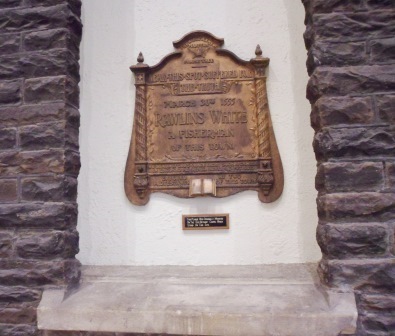 The James Howell store bought the chapel in order to expand but preserved the wall and its plaque. Wales also has a memorial in Carmarthen to another Marian martyr, Robert Ferrar, bishop of St David’s, who seems to have fallen victim to a stitch-up by the Cathedral chapter (now, what does that remind me of …) but as far as I know there is no memorial to the third Protestant martyr, another Cardiff man, Thomas Capper. He was burned in 1542, during Henry VIII’s reign, possibly for challenging the idea that God was really present in the Mass.